There is no verse in the Ten Commandments that reads, “Thou shall not hunt for sport.” Nor, for that matter, does that verse appear in any other part of the Bible. So what’s so un-Jewish about hunting? Of the billions of people who have read the Bible, more will remember its stories than its commandments. And it’s quite obvious that, as a book in which every letter is calculated, the stories that the Bible chooses to tell are there for a specific reason. For starters, there are the messages they convey to us through the depiction of their heroes. Even a child can pick up lessons about hospitality from Abraham, or lessons in leadership from Moses. Then there are the lessons we learn from the bad guys: what not to do and who not to be. Two ignoble characters who appear early on in the Bible are Nimrod and Esau. Interestingly enough, there are two people in the entire Bible who are described as hunters. You guessed it: Nimrod and Esau. And the youths grew up, and Esau was a man who understood hunting, a man of the field, whereas Jacob was an innocent man, dwelling in tents. There is another Jewish value to which this sport would run contrary: the laws of conservation.15 Everything in this world has a “soul,” a spark of Divine purpose, or that which animates it until it reaches the goal for which it was created. If a human being has a need for this other creation, then the animal and vegetative kingdom are contributing to the human’s mission in this world, which is ultimately the soul of every creation’s existence (see The Development). If one is hunting to utilize the hides of animals for things that are justifiably beneficial for the human, this purpose is achieved. Similarly, if the animal is being used for medical research, this can be justified. But if one is killing animals for sport, he is cruelly depriving the animal from realizing its ultimate potential. The Lubavitcher Rebbe, Rabbi Menachem Mendel Schneerson, of righteous memory, referred to the cruelty of hunting in his talk of January 31, 1972.16 He recounted the story of his predecessor, the sixth Chabad Rebbe, Rabbi Joseph Isaac Schneersohn, where he was rebuked by his father when he mindlessly tore a leaf off a tree (see “The Leaf“), illustrating that this idea applies to carelessly ruining the plant kingdom as well. Whether because there is an actual prohibition involved, or because it runs contrary to the morals and values taught by the Torah, hunting is not a good sport for a nice Jewish boy or girl. Try basketball. Talmud, Chullin 89a: “I bestowed greatness upon Nimrod, and he said: Come, let us build us a city” (Genesis 11:4). This reasoning was given by the Rabbi Yechezkel Landau (1713–1793), Chief Rabbi of Prague, in his volume on Talmud and Jewish law, the Noda B’Yehudah (Mahadura Tinyana, Yoreh De’ah 10). “If any man, whether of the family of Israel or a proselyte who joins them, traps a quarry of wild animal or bird that may be eaten, and spills its blood, he must cover [the blood] with earth“ (Leviticus 17:13). The law here refers to catching an animal in order to kill it through kosher ritual slaughter. This obligation is also mentioned in Exodus 23:5. There is a Talmudic debate (Bava Metzia 32b) if the broader prohibition of not causing pain to animals is actually a Biblical prohibition, or a Rabbinic prohibition based on this. The majority of authorities on Jewish law are of the former opinion. See Talmud Bava Metzia ibid., and Maimonides in his Code of Jewish Law, the Mishneh Torah, Laws Regarding the Murderer and the Preservation of Life, ch. 13. See Sefer HaChinuch, mitzvah 451. See also ibid. 186, where he points to the Torah’s expression “he has spilled blood” used regarding the purposeless killing of animals, which is reminiscent of the expression used for killing humans (see Judaism and Vegetarianism). See Rashi to Talmud, Avodah Zarah 11a, where he says that it is forbidden to cause a kosher animal to become treifah, fatally injured. See, however, Tosafot ad loc. Responsa Shemesh Tzedakah (late seventeenth century) cites this as another issue posed by hunting. This is deduced from the dialogue recorded in the Talmud, Chullin 7b, where Rabbi Judah the Prince sought to eliminate the danger of being kicked by a wild mule. When he suggested maiming them—“I shall hamstring them”—the reply he received was, “You would be causing suffering to the animals.” When he suggested just killing them, the reply was, “There is the prohibition against wanton destruction.” It is implied that killing them would not be considered causing suffering to animals. See, however, R. Bezalel Ashkenazi, in his volume Shitah Mekubetzet on the Talmud, Bava Batra 20a, in the name of Rabbi Joseph ben Meir ibn Migash, where he says that there is a prohibition of causing pain even if the animal died immediately, which is waived only in the face of actual benefit to a human. The source of this law, known as bal tashchit, is Deuteronomy 20:19, where the Torah prohibits the cutting down of a fruit tree in the course of war. Jewish law interprets this as a prohibition against all wanton destruction. One who breaks vessels, tears clothes, demolishes a building, stops up a spring or disposes of food unnecessarily, transgresses the prohibition of bal tashchit. (See Maimonides, Mishneh Torah, Laws of Kings 6:10). Corresponding to the 15th day of the Jewish month of Shevat. The Midrash (Vayikra Rabbah 13:3) takes this a step further and says that one who does not participate in the kenigyon in this world will merit to see the “Celebration of the Leviathan” in the World to Come. See Rabbi Moshe Isserles (the Rema) and commentaries to Shulchan Aruch, Orach Chaim 316:2; Rabbi Shneur Zalman of Liadi, Shulchan Aruch HaRav, ibid. 316:3. Loan to Someone Who Cannot Repay? Is Prisoner Exchange A Jewish Value? Should I Serve G-d With Marijuana? 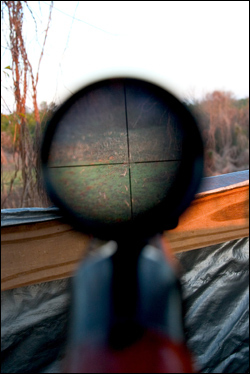 What Did the Rebbe Say About Hunting? jewish antipathy towards hunting Your article is very interesting. Response to the Dark Knight If the hunting is not just for sport, but for the use of the animal then it would seem that you're in the clear. I don't want to offend your friend, G-d forbid, but just make sure you're not "in the company of scoffers who hunt with dogs". I plan on starting to hunt I plan on hunting, but with someone else (a non-Jew). The plan is to hunt myself, and have the non-Jew claim the animal (this, no waste and the animal fulfills its purpose). I currently shoot at the range (archery and firearms) and thought about hunting for a while. Is this manner of hunting concurrent with Halacha. we see the world through a different lens this is my response to Dr. Harry H. We all diffract the light differently and I only listen to words that are about this thing I call love. When I feel most misunderstood I go to Rumi, for his poetry of truth. It is here I am at home, as a knowledge of the beauty of unity, of what us Divine, of love for what is Divine permeates this ecstatic vision. Here there is room for me, as I understand him in his deepest spirituality of being. Hunting I am casually reading this as a Gentile, and I live in Atlanta. Most Jewish people I know live in the city, have pre-packaged food, Kosher canned food, and things they can buy at the nearest bodega. Some have told me they tend to the urban sphere, though I imagine this would be different in a nation like Israel. I myself shoot, but don't hunt. But I have many friends who do hunt. And they are the kindest and most selfless folks I know, who would give the shirt off their backs to help you. The American Indians hunted, and did not have the violent predisposition their agrarian invaders did. Study more Ruth, please read some more, and understand the nature of Jacob, Issac, and Essau. There is Judgement and Compassion on high and in the world below. We are not going to be catapulted anywhere except in the sling of the Heavenly Court for a real cleansing. Have faith, have hope, atone, and pray. Do you really think that evil will just be catapulted into Gan Eden? Is there no justice in the world? That Hashem ignores those who sin, and then rewards them? Never gonna happen, despite all the singing about, "Let the Sun Shine In," from the old movie Hair. I have to say, Dr. Harry Hamburger that there has to be a sense of humor in the universe, and that G_d just HAS to be laughing, because I wrote the other day, on Chabad, about a song called MacDonald's on line, to a woman who had written consequent to an article, in the comments section, like this, that as a restaurant worker she has never been acknowledged, no thanks. This song by my daughter is about just THIS, and of course hamburgers is where it's at. I would be a vegetarian if I had to kill anything, so that's how it is for me, and that wouldn't be too terrible. My daughter is a vegetarian and she's been one since age 9, her decision, more humane than what I do, and she's not a hypocrite, and I must be. As to the world going to hell in a handbasket, Moses was picked up in one of those, and I do not see it this way. The alarm clock is ringing, time to wake up OK all you city folk living in the Galut, eating your pre-packaged food, and Kosher chicken wings. Soon, you will have to grow your own food, hunt and catch what you can find, and kill your own chickens, or you will starve. What is going to happen? We Jews are all too comfortable in our exile, eating from the gentiles table, and living under their law. "Because you have not followed my commandments, I will scatter you among the nations, and your feet will know no rest." The "WARS" of the rich Cruel enough that man should cause unecessary pain and death of animals, many WARS for various world resources for the multi-national-rich who enlist, by law, young men and women to "hunt" and "kill" their fellow man.